Make gorgeous DIY florals with acrylic pouring – easy and fun! Sometimes, the acrylic pouring beginners are tempted to dump absolutely all available colors on the canvas at once. But we are not beginners anymore, right? There are more than enough similar-looking canvases with cells and it’s time to move on. 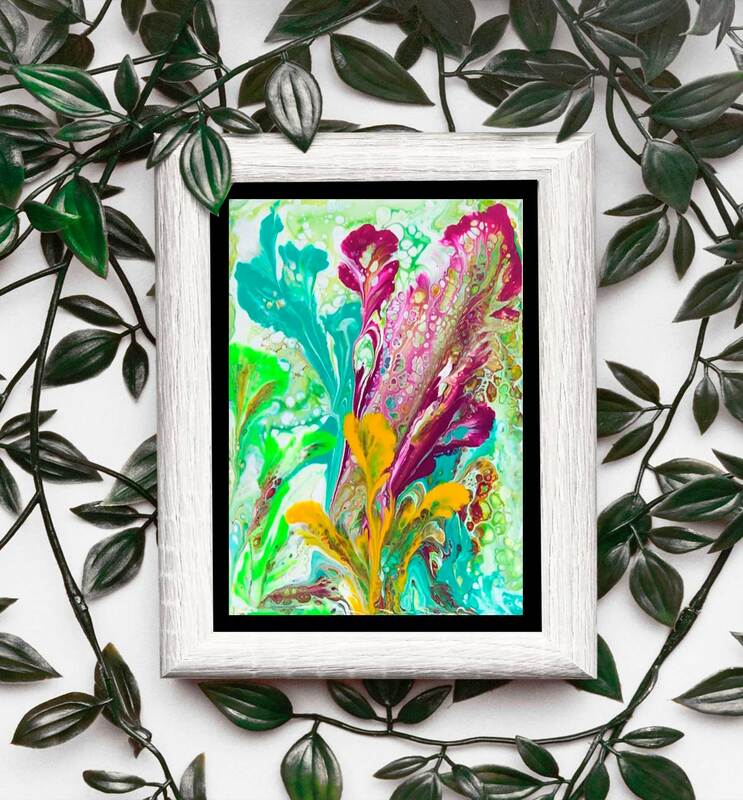 Flowers are starting to trend in the poured painting world so we collected a few unique acrylic painting techniques and tutorials by a group of fluid painting artists for amazing DIY florals. Learn how acrylic pour painting on canvas combined with a few smart but easy painting techniques will help you with creating the most gorgeous floral wall art! It is time for advanced acrylic pouring on canvas for most gorgeous floral wall art! Susan King shows that there is no reason to be afraid of a white background. This floral art piece is absolutely gorgeous! Note how “Cells” create an impression of water drops. 3 parts paint,1 part Floetrol, about 5 large drops of varnish water until the right consistency. 3 drops of coconut serum in all colors except white. Another example of amazing fluid acrylic florals from Susan confirms that pouring technique can be transformed to produce more realistic styles of painting. 3 parts paint, 1 part Floetrol, 5 large drops of gloss varnish water Coconut Milk Serum for cells. Use 4 times more white than the other colors. Susan King’s paint pouring art experiments should really inspire you! Of course, you may choose different colors or background but utilize the same acrylic pouring technique to create amazing DIY florals. 1 part paint, 2 parts Pouring Medium (Liquid Paint) 2 parts paint 1 part Pouring Medium It should be really creamy. Then add water till you get the right consistency. Runs in a stream off the stick Add Silicone or Coconut Milk Serum or whatever you use. Sue Thomas demonstrates that there is more to acrylic pour painting than producing billions of “gorgeous” abstract variations of acrylic pouring cells. Sooner or later some of the beginners decide to make a step toward finding their own distinct style. Here is a good example of how you may start doing just that. Sue used white paint mixed with Floetrol. Then she added green and purple colors also mixed with Floetrol. For “painting” irises two packaging strings were used (watch the video to learn how). 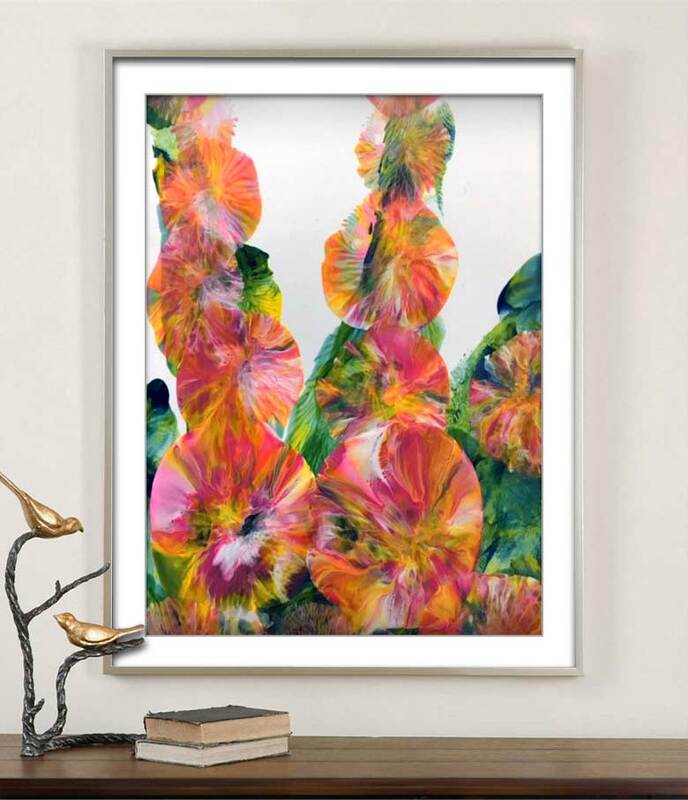 The result is very impressive and creates a beautiful DIY floral painting to adorn your walls rather than “faceless” abstract pouring. Here is a nice example of using just a few colors for creating an elegant white flowers composition by using acrylic pour painting techniques and string pulling method. *Note that silicone and WD40 have much better time-tested substitutes like linseed oil. For pure “pour painters” using classic brushes is a big “no-no”. Blowing through a straw is still allowed because paint could form pretty unpredictable shapes. If you’ve ever played the flute, then you understand that it is hard to control even flow of air. What I mean is that sometimes you blow harder than other times, you can see where I blew too hard at times throughout the video. Tip: Take breaks to breathe so you don’t pass out! The more I play with blow painting and using a hair dryer, the more I’m thinking about purchasing an airbrush. I wonder if the airbrush would offer more control. Let me know if you ever experimented with the airbrush to blow on acrylic paint and tell me how it worked out for you. Spring is literally pouring out of this canvas! 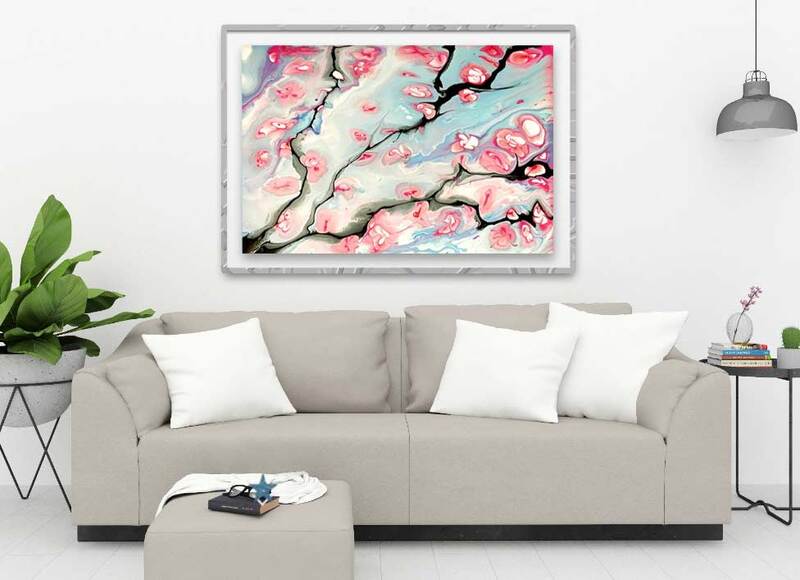 Reminiscent of Japanese art, fresh air, cherry blossoms, and graphic tree branches create a happy positive mood. What a wonderful DIY floral painting to refresh your home decor! This painting has a dirty flip cup acrylic poured background and then the flowers are made by layering drops of pinks and white paint and dragging a ball end stylus through to make the flower petals. The All of the paints were mixed equal measures of the paint and Golden Polymer Medium Gloss. *There’s no silicon oil or torching in this or any other projects by DeliberatelyCreative. We all have to weigh the pros and cons of how we interact with our art supplies. Experimenting can be exciting and beautiful but there can be consequences we don’t know about yet. As with anything in life be informed by reputable sources and your own common sense. I like to make it feel more like art. I have an array of colors I premix and put into squeeze bottles for this style of acrylic pouring/swiping. I mix all my colors 1:1 ratio of paint to Floetrol latex based. If, like Sandra Lett, you are not afraid of traditional painting with the brushes then go “paint and pour” way! Koi Fish are not florals, but with a pinch of imagination, you may paint anything using this mixed technique. Fluid Acrylic Painting with Balloons Technique – Hollyhocks Fast and Easy! This technique is a simple pure fun! It only takes 6 minutes to create this gorgeous floral masterpiece reminiscent of French Impressionists’ paintings. All you need is a few small air balloons and basic craft paint. Press balloons into multi-colored acrylic paint puddles and then transfer the paint onto paper or canvas. Solar White 110 lb Neenah Cardstock cut into 5.5″x 8.5″ pieces and then folded in half to make greeting cards. Imagine a small wedding or shower with hand painted invitations with your own original art! Color Shift Blue Flash 1oz Paint, 1/4 oz of Liquitex Pouring Medium NO water. 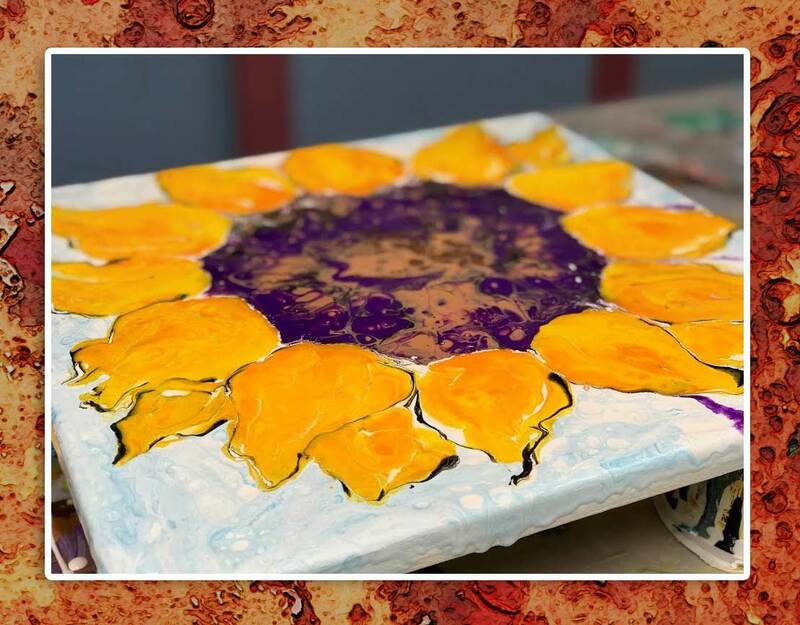 The iconic Sunflower wall art masterpiece is within your reach … and you will be able to Do It Yourself after watching this fluid acrylic instructional video. This Sunflower DIY floral is one of the easiest and fast paintings you can create with acrylic pour technique. Delicate and light colors work beautifully with any modern interior. Ann Osborne creates this dynamic canvas that will go great with any modern and neutral decor. This is another quick tutorial for a smashing fluid acrylics method. You can create a beautiful masterpiece for your walls even if you never painted flowers. Amazing colors and intricate design may lead you to think that it is really hard to achieve the same results. But watch the video to learn how to create a similar acrylic pour masterpiece yourself using this acrylic pouring recipe. You’ll be amazed!